About the breed - Bichon frisé - Hardy-Flap's kennel - Bichon frisé! Bichon frisé – Hardy-Flap's kennel – Bichon frisé! Bichon frisé is a breed with lovely temperament and lots of attitude. He is positive, lively and intelligent and he likes to use his “brain”; traning obedience, agility and flyball is popular. The bichon enjoys to go for long walks in the woods, but a walk around the block is just as appreciated.The bichon can be very stubborn and when this happens his owner has to be even more stubborn! It’s a real show dog and can make a lot of follies just to get your attention. The coat is white and soft and the eyes, nose and halos are black. The bichon moves with his head high and proud and the tail is carried in a bow over the back. His maximum height is 30 cm and a bichon should have scissors bite. In the beginning the bichon frisé was called bichon teneriffe, as the breed’s origin can be traced to this the largest of the Canary Islands. The bichons probably came to Teneriffe with Spanish sailors in the 14th century, and from Teneriffe they accompanied the sailors all around the world. During the 15th century the bichon’s popularity grew immensely at the Renaissance courts in France and Spain. Among the courtiers it became a fashion whim to carry the bichons in baskets around the neck. They did this to keep their beloved bichons as close as possible at all times! Several artists who were active during this period in time, among them Francisco af Goya, included the little white dog in a lot of their paintings. The end of the 18th century also meant the end of the comfortable court life for the bichon. By using his natural talent for follies he now had to earn his living as a vagabond and circus dog. The bichon was surely as appreciated in these circles as he once had been at the courts. The bichon frisé is quite a young breed and the first breed standard came in 1933. The breed was approved by the FCI as a French/Belgian breed. 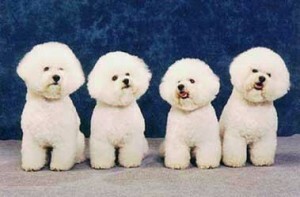 When the bichons began to be shown trimmed, its popularity grew. The trimming brought out the beautiful proportions as well as the breed’s expressive eyes. Today the bichon frisé is presented trimmed in almost every country. The first bichons came to Sweden in 1976 and its popularity has increased over the years. The bichon frisé is a breed with a lot of coat and you have to be prepared to put a lot of time and effort in its coat care. The bichon shall be brushed and combed every day and it needs to be bathed every second week. The dog should be trimmed every fifth-seventh week.